A few years back when we were still living at our old house, we bought this great chair at an antique shop. It had been painted white and was perfect for the corner of our bedroom next to the window. We sold a lot of our furniture when we moved since our current place is much smaller than our old house, but we brought along the antique chair. It had a home on our back porch and was put to good use whenever we had company. Seems that it was used a little too much because it started to break. The back basically fell apart and we tried to fix it to no avail. We brainstormed new uses for the chair, with our original thought to turn it into a flower planter of some sort. That never really panned out, so the other day David suggested we remove the back and use it as a stool. Seemed like a great idea until we realized the bottom was shot, too! There was a big crack down the middle and it was starting to cave in. Definitely not safe for anyone to sit on. I got frustrated, thinking we'd have to pitch the whole thing. But then, a light bulb went off. I've been wanting a side table next to the swing for drinks and magazines, and thought this might be perfect. It was just about the right height, but the top was damaged from removing the back. David offered to sand it down and repaint, but I suddenly remembered a little bit of fabric I had picked up a long time ago in the remnant section at Hobby Lobby, and our new side table was born! I really like how the legs are visible and it still looks a little distressed. I got a deal on mums at Buchheit's while picking up some chicken feed and used some of them to liven up the space (the container we used is recycled from a housewarming gift from our friends Jay and Angela). It didn't take David long to put the table to good use. We also have an idea to use the back of the chair in our revamped garden next year. Be on the look out for how we repurpose the back in a future post! I can picture the back of the chair stenciled or painted in a garden patch showing what's been planted or as a sign for "eggs". I can't wait to see what you make of it! That's a good idea on making it into a sign for eggs. I like that! What a super cute and clever idea. I agree I love the rustic appeal of the legs. Thank you so much for linking up to our blog hop today. Thanks! I really enjoyed the blog hop. Thanks for the opportunity! Awesome idea! Would be great to use a few lined up with planks on top as a bench, too! Oooh, that's a good idea! I'll have to keep that in mind for the future! Great idea! Always love finding ways to repurpose things (and save some money). Super cute table! Stopping by from Tilly's Nest! hmm...love this. 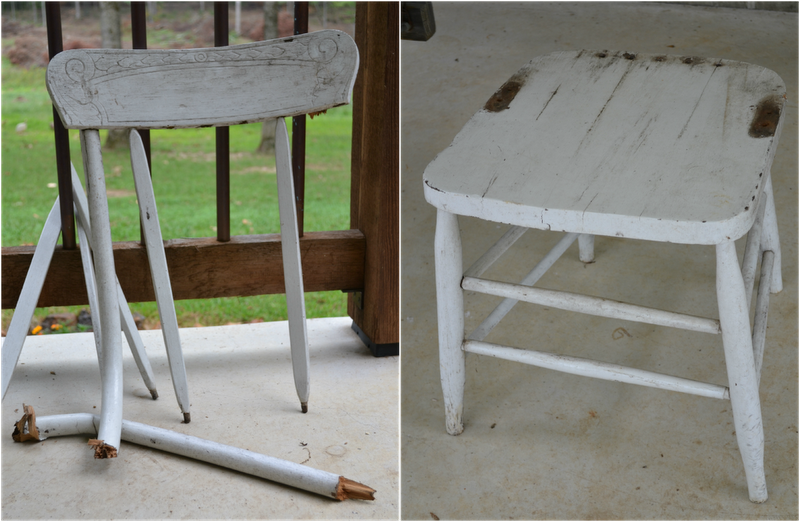 I have some old chairs in the summer house that just might be good for this. Thanks for the great idea, and for sharing at Repurposed Ideas Weekly this week. Of course! I was very happy to share on Repurposed Ideas Weekly! cute as can be...love this idea.Saw u @ Creative Cain Cabin. Darling I just love it and the tablecloth is so cute also:) Thanks for sharing at the Cabin!